It Could Happen…It DID Happen! They say history is made every day. Most of us read about it on the Web, watch it on the news or recall it years later when reading it in books. Today, I had the privilege of witnessing a truly historic event that will be talked about for many years to come. I saw the space shuttle Atlantis launch from the Kennedy Space Center. I was there to support the Kennedy public affairs staff as they handled the crush of press interest. I was in good company; representatives from several other NASA centers were also on hand to help facilitate interviews with over 1,000 media representatives reporting on the event. 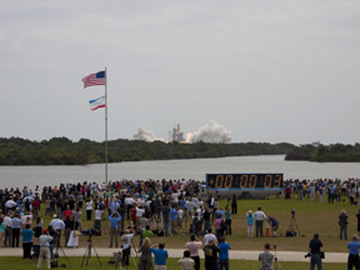 I am told that up to a million people made the pilgrimage to Florida’s Space Coast in the hopes of catching a glimpse of the orbiter ascending from the launch pad and into orbit. Young and old, enthusiasm was high. Image right: Media from around the world were gathered at the Kennedy Space Center press site for Atlantis’ final launch. As I sat on the balcony of my hotel Thursday evening, a gentleman and his son said hi from the adjoining balcony. They had traveled from western Florida to watch the launch–their first. As we watched the rain pour down on the cars parked below, they asked me if it would go. “It could happen,” I replied. When I arrived at the Kennedy press center early Friday morning, weather was still an issue. The clouds were thick, with remnants of an overnight rain still visible along the roads. It was surprising to hear the optimism among the staff and media present. Hey, it could still happen, right? Then as the morning flew by, the clouds began to weaken. At the T-9 minute hold in the launch, the sun began peeking through a few of the clouds. Maybe it could happen! The countdown clock began ticking once the planned hold was lifted, and the press center was the emptiest it had been all day. I joined the media on the lawn near the infamous countdown clock. As it ticked past the one-minute mark, camera shutters began clicking, broadcast media narrated the unfolding events…and then the clock mysteriously stopped at 31 seconds. People looked around, searching for an explanation. Did they scrub the launch attempt due to bad weather? I started heading back into the media center to see what was going on. Maybe it wasn’t going to happen, I thought quietly to myself. But just as quickly as the clock had stopped, it started again. The crowd was abuzz; it IS going to happen! Three, two, one…liftoff! I had just witnessed history, the last liftoff of the last mission for the space shuttle. On my way back to the hotel, it was sad to think that this era of U.S. human space exploration was coming to an end. As I sat in traffic, I saw five kids posing for pictures on a small replica of the space shuttle in front of a City of Port Canaveral building. They were hanging onto the wings and taking turns sitting on top of the space shuttle, no doubt pretending they too were making history as their imaginations took them to space. Maybe they will be the next astronauts going to Mars or to destinations beyond. Yep, I thought to myself. It could happen. Author krohrerPosted on July 11, 2011 March 15, 2013 Tags Atlantis, Dryden, General, NASA, space shuttle4 Comments on It Could Happen…It DID Happen!